Erik Lamela has revealed that his father has been desperate to get his hands on a Lionel Messi shirt. Fortunately, the Tottenham man is about to deliver for him. The pair clashed at Wembley on Wednesday night as Barcelona faced Spurs in the Champions League with the Catalan giants coming out on top in a 4-2 win. 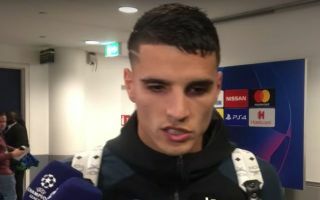 Messi was influential as he bagged a brace, but Lamela revealed after the game in his post-match interview that his dad has been pushing him to get his hands on his compatriot’s shirt for him, and the 26-year-old can now finally say he’s got it for him. With a whole host of Spurs players likely to have been desperate to get their hands on Messi’s jersey, he’s shown his class by making sure Lamela’s got something special to give to his dad, albeit it’s unclear as to whether he made him aware of where the shirt is eventually going to end up. Either way, it’s a nice touch and although there will be disappointment for the Spurs man over losing the game, he let out a wry smile when discussing the gesture and he will undoubtedly now bring a smile to his dad’s face too.